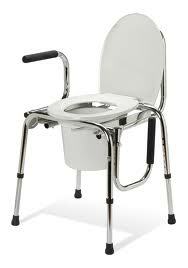 A drop arm commode is as simple as a 3-in-1 commode with an added whistle - the side arms drop. Very handy when it comes to having to clear your tail end from hitting that side arm when moving from your bed to the commode. Better yet for those needing a little extra room to sit comfortably on these nature necessities. These commodes look just like the basic 3-in-1's do; a simple frame, a removable, washable bucket, a seat lid, splash guard, adjustable legs but with the added convenience of being able to get one or both side arms out of the way during a transfer. These added feature are handy when a patient is too weak to be able to clear their back end from hitting the side of the commode or when a caregiver may not be able to help the patient clear the side arm. At times, weak kneed patients are unable to stand tall enough and then pivot transfer to the commode so a low pivot transfer is required. Dropping the side arm makes this transfer a super success. Sometimes getting a side arm out of the way just ads more space to tight quarters. I've seen such a small bathroom that a nose over toes take a patients head right into the wall! Our solution was to get this commode to avoid a lot of leaning forward for the transfer, making it a low pivot transfer. The downfall of this commode is seen when the arm is dropped to get on the commode and now is needed for standing leverage to get off the commode. You can swivel the arm back into place but now your patients tail end must clear the arm for the transfer...tricky. Most would agree, however, that if the patient needs assist to the toilet bedside commode, they will also need assist back using the same tricks.